2016 Best Year for Housing Since Recession! Over the past week, mortgage rates were negatively affected by comments from Fed Chair Yellen. In addition, investors shifted assets from bonds to stocks, as the Dow rose above the 20,000 level for the first time. Statements from the Trump administration about potential policy changes continued to cause volatility. The net effect of these influences was that mortgage rates ended the week a little higher. Fed Chair Yellen gave two speeches late last week, which were viewed as more hawkish than expected, meaning more in favor of tighter monetary policy. Yellen said that a gradual tightening of monetary policy is appropriate and that it will take place through federal funds rate hikes and reductions in the Fed’s balance sheet. Her target level of 3.0% for the federal funds rate at the end of 2019 exceeded the outlook for most investors. This increased concerns that a reduction of the Fed’s holdings of mortgage-backed securities might begin sooner than expected, which would be bad for mortgage rates. Recent housing data confirmed that 2016 was the best year for the housing market since before the recession. In December, housing starts rose 11% from November, well above the expected levels. 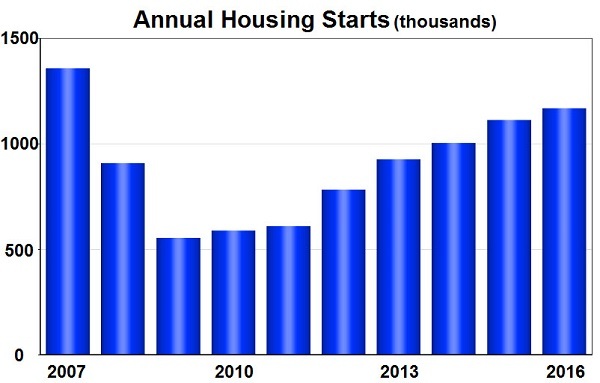 For the year, housing starts were 5% higher than in 2015, making it the best year since 2007. Sales of previously owned homes in December remained near the best levels of the year, and 2016 as a whole had the highest level of sales since 2006. Recent data also revealed that inventories of homes for sale are at extremely low levels, so it is nice to see the strong data on housing starts. Looking ahead, additional information about policy changes under the Trump administration could continue to influence mortgage rates. Also, the next Fed meeting will take place on February 1. No policy changes are expected. Before that, New Home Sales will be released on Thursday. The first reading for fourth quarter Gross Domestic Product (GDP), the broadest measure of economic activity, will come out on Friday. Pending Home Sales and the core Personal Consumption Expenditures (PCE) price index, the inflation indicator favored by the Fed, will be released on January 30. Wentzville may be making moves to become a charter city! Read below and follow the link to learn more about one of St. Charles County’s fastest growing city! The City of Wentzville is exploring the idea of becoming a charter city. There are different types of municipalities, a village, a 3rd Class City, a 4th Class City and a charter city, Currently, Wentzville is a 4th Class City. A charter city is not controlled by the state whereas the other types of municipalities are subject to limitations based on state laws, meaning the city residents cannot dictate laws and elected offices. We can’t wait to share this news. Just…WOW! Another step to help home buyers accomplish the purchase of their dream home! Thank you to National Association of Realtors for sharing this exciting news! 2016 was another new record year for Sunshine Realty! We continue to see tremendous growth. We have YOU to thank for it for your past, present and FUTURE business! Thanks for the love everyone :). Have a Sunshine year!! Happy 2017 and cheers to continued growth and opportunity!